Welcome to the latest chapter in our 100th game celebration, in which we journey back to 1996 – a year of great change, when the success of Worms hadn’t yet taken full hold and as our final Amiga releases began to give way to new horizons on PC and console. Missed a previous chapter? Check out our article on 1995 or start at the beginning in 1991! Hot on the heels of the PC release of Worms, came this “expansion pack”, which anyone born after 2000 might call “DLC on a disc”! In many ways, Reinforcements was designed to bring PC’s Worms up to the standard of the Amiga release by implementing the custom soundbanks and user-made levels that Commodore gamers were already enjoying, courtesy of ubiquitous software packages like Deluxe Paint. In fact, the CD came pre-loaded with a handful of custom levels made by Team17 staff, some screens for which you can see below. “My brother Ian convinced Clive Minnican and I to do an RPG game, as our first game,” recalls The Speris Legacy designer Andrew Jolly. “I really wanted to do a game based on Scorched Tanks, like Worms, but hindsight is a wonderful thing! We all looked to Japan for inspiration for how we developed games back then and The Legend Of Zelda was obviously the best game to base any RPG success on. Sharma City, the first level, looks the most like Zelda, but the game itself has a totally different speech mechanism. Also we only had a tiny budget and three full-time people working on the actual game development compared to Nintendo’s massive budget and 30+ development team.” The Speris Legacy was nothing if not ambitious. As Team17 began to move away from the Amiga, our other passion – Japanese arcade games – hadn’t quite dissipated just yet. Take World Rally Fever, for example. Squint a bit at this sprite-scaling racer and you’d be forgiven for thinking it was Sega’s own Power Drift or Outrunners. For those who weren’t there at the time, Sega’s sprite-scaling arcade games, like OutRun, Space Harrier or Afterburner used a layered effect to move and scale different chunks of the background in such a way that it created the illusion of fast 3D movement, using only 2D graphics. Even to this day, there’s a bit of a wow factor that comes from the effect, and World Rally Fever had that same factor in spades. It looked amazing, used the effect over a variety of attractive locations and themes, and just begged to be played. “Another fun fact is that the Wikipedia entry for World Rally Fever stated for the longest time that the game was made by a Japanese dev when we were really three blokes sitting in Brussels!” For a team that loved Sega arcade games and tried to create their own, there can arguably be no greater compliment! After the miraculous technological breakthrough that was 1995’s Alien Breed 3D, it’s understandable that the team would want to push the envelope even further with a sequel. If Doom on the Amiga could be achieved then why not Quake on the Amiga? Alien Breed 3D II reached way farther than you could possibly have imagined at the time. 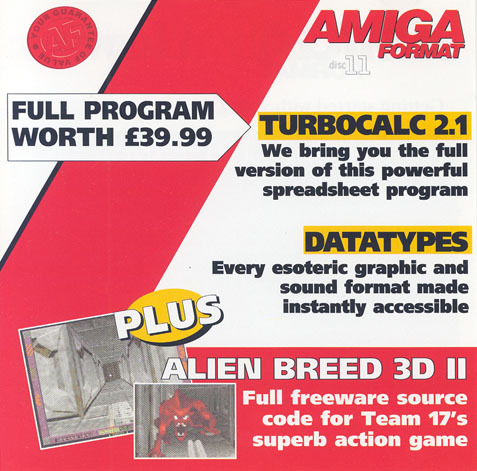 Essentially developed with heavily expanded “AGA” Amigas in mind, Alien Breed 3D II (or The Killing Grounds as its packaging would have believe the game was really called) came with two versions in the box – one to run on standard Amiga 1200/4000s with 2MB of RAM and another for those lucky enough to own a 4MB expansion. Furthermore, owners of the fancy wave of extremely expensive accelerator cards that were beginning to emerge on the Amiga marketplace could also enjoy improved performance. On a 2MB Amiga, the game ran in a tiny window with certain visual effects like textured floors and ceilings turned off completely, while on an expanded machine, players could enjoy the game firing on all cylinders and pulling off a technical feat that really should not have been possible on the hardware. But, if we’re honest, it was a game that looked astonishing in screenshots but didn’t live up to the high standard of the Alien Breed series in gameplay. In fact, when editing Team17’s 100th Game Celebration video this year, one of our editors sent back the footage saying, “I think there’s an error in the recording because the frame rate is so low.” There was no error. Back in 1996, this bursting of the technical bubble didn’t really matter so much. In fact it was mostly viewed as a strength. After the demise of Commodore and the new gaming age ushered in by PlayStation, support for the Amiga was seriously dwindling and Amiga owners loved that there was still a company out there not only supporting the platform but also achieving the impossible. And the Amiga gaming press was similarly forgiving, with a wave of 90%+ scores. All except Amiga Power, who in their very final issue published a review with a whopping great fake score of 98% at the foot of the page but with a real score of 54% hidden in the body text to punish those readers who always skip the review and go straight to the score. You can read the whole four-page review right here. The Killing Grounds source code was actually given away in full on an Amiga Format cover CD in ’97. Thankfully for Andy, he got his redemption with another technological breakthrough, but you’ll have to wait for our article on 2003 to hear about that. As for Alien Breed, it actually did “just stop” here for a very long time. With the end of the Amiga, the misfire of The Killing Grounds and a new console-centric environment that left Breed at the mercy of third party publishers, it would be over a decade before another Alien Breed game would make it to release. Stay tuned for the story on that one – and some of the cancelled games along the way – another time. Despite the impressive graphics, unfortunately not everyone was blown away by X2. It was brutally difficult and played quite differently to the Japanese shooters that many console owners preferred. Which is where Capcom, of all companies, stepped in. The house of Street Fighter picked up X2 to publish in Japan, and with their years of experience creating their own arcade shoot-‘em-ups like 1942 or U.N. Squadron, they took the unusual decision to help re-design X2 for Japanese tastes! 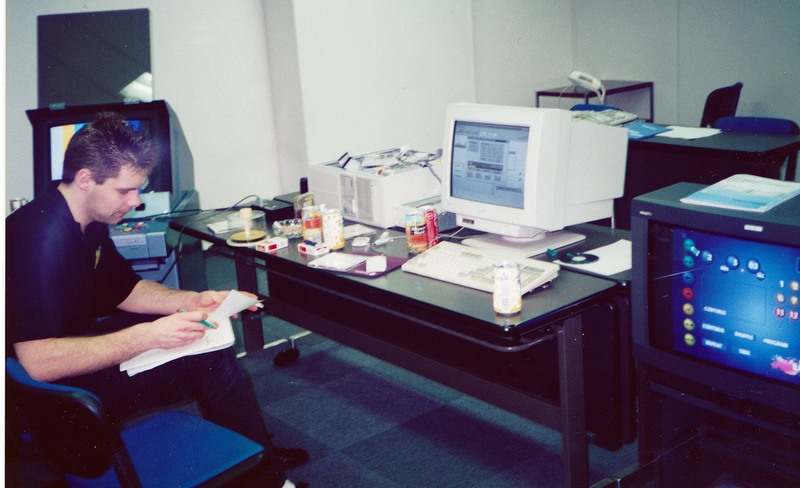 Andreas Tadic deep in the bowels of Capcom’s Osaka HQ, working the improvements to X2. Unfortunately, the Capcom release of X2 is extremely hard to find these days. We don’t even have one in the Team17 office! So if you’ve always wanted a sequel to Project X then you’re either in for a hard time tracking down the Japanese release or an even harder time finishing the European one! That’s all for 1996! In the next chapter we’ll be looking at both 1997 and 1998, with insights into not one but two Worms sequels and a point-and-click adventure starring the Bruce Willis(‘s German dub artist)! In the meantime, why not check out our article on 1995 or start at the beginning in 1991? We’d also love to hear what your favourite Team17 game is. Let us know on Twitter using #100Team17!